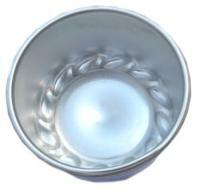 This is a 4-inch jelly mould made from aluminum for excellent heat conductivity (bakes fast and more important evenly). Suitable for mini cakes, mini tarts or sweet buns. With a little creativity, you can turn out some lovely treats from this amazing cake pan to woo your guests. It is easy to use, long-lasting and robust. They are wonderful for kids birthday parties or vintage-inspired tea parties, and jelly-lovers will want to use them time and time again!